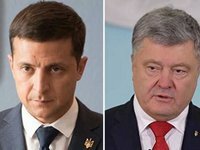 The NSC Olympiyskiy state-run enterprise has received requests from representatives of presidential candidate Petro Poroshenko regarding the holding of debates on April 14 and April 19 and from representative of presidential candidate Volodymyr Zelensky to hold debate on April 19, 2019. "Given the public interest in the subject of the debate at the NSC Olympiyskiy, we inform. The NSC Olympiyskiy state-run enterprise has received requests from authorized representatives of presidential candidates of Ukraine to hold debates. In particular, from a representative of presidential candidate Poroshenko Petro Oleksiyovych – for April 14 and April 19, 2019, and from a representative of the candidate for presidency Zelensky Volodymyr Oleksandrovych - for April 19, 2019," the NSC Olympiyskiy reported on Facebook on Wednesday. The NSC Olympiyskiy reported that they had initiated a negotiation process with representatives of these candidates regarding the provision of debate in the sports complex.